This month, the first of many projects to restore coho habitats in Nehalem River took place locally. 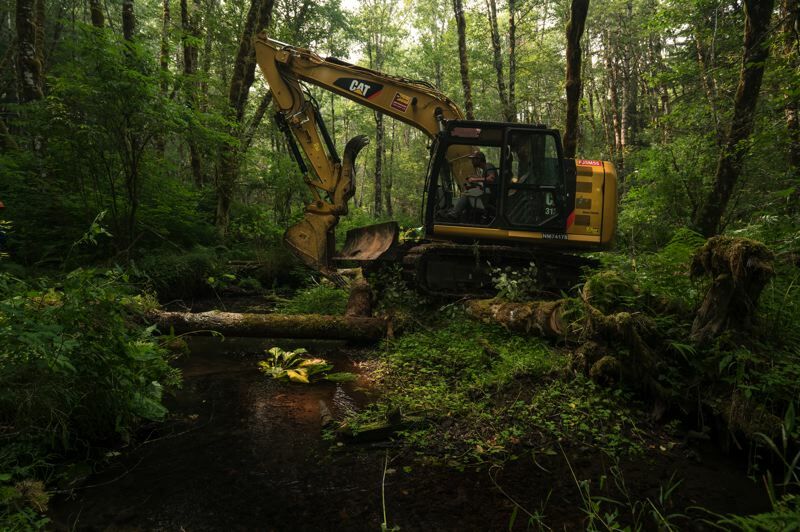 In an effort to restore coho salmon habitats in the Nehalem River, Washington and Clatsop counties are now home to 27 beaver dam analogs constructed over the summer. Several nearby streams now boast the man-made beaver dams. It's a catalyst project for a large number of planned restorations, and organizers say if they turn out to be successful, Oregon Coast coho could become the first Pacific salmon recovered and removed from the endangered species list. "The health of Oregon's coast coho populations is a vital indicator of the health of our coastal watersheds," said Mark Trenholm with the Wild Salmon Center in a statement. "These fish are threatened after 150 years of land use on the coast that has altered watersheds and degraded critical coho habitats. Loss of watershed health has impacted local communities through increased flooding, impaired water quality, and less economic activity from commercial and recreational fishing." 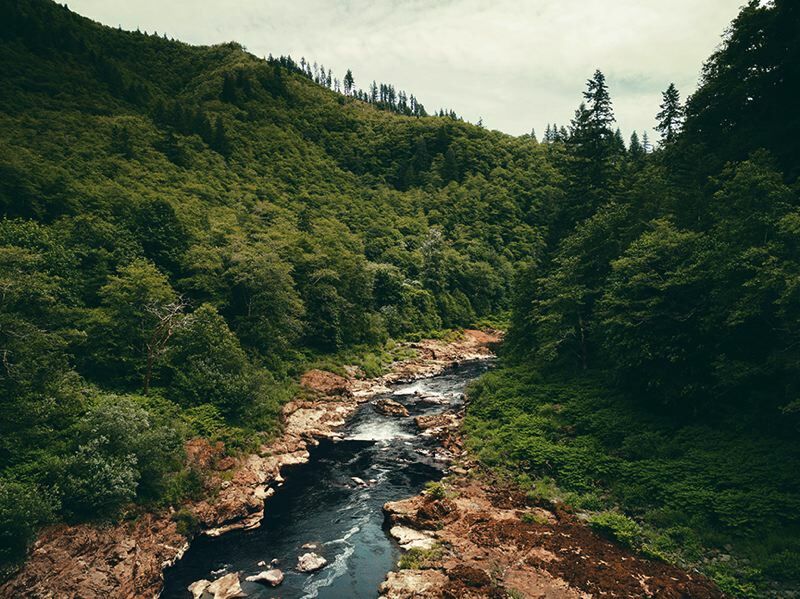 The Nehalem River is the largest "wild fish only" river on the Oregon Coast, running 118 miles long through the communities of Vernonia, Nehalem and Pittsburg. A major part of being able to maintain this: beavers, which shape their own environment by building dams from wood along waterways. The dam analogs have been set up in four salmon anchor habitats: North Fork Lousignont Creek, which flows into the upper Nehalem River near Highway 26; Olsen Creek and Bear Creek, which are tributaries to upper Rock Creek that flows into the Nehalem in Vernonia; and Buster Creek near Jewell, said Maggie Peyton, the Upper Nehalem Watershed Council's co-founder and executive director. "By damming up small tributaries, beavers provide shallow, cold water pools where coho can find food and cover from predators," Trenholm said. "These types of off-channel habitats are essential for juvenile coho to survive and grow during the year they spend in freshwater before migrating downstream to the ocean." This is just a pilot project, Peyton said, and organizers will monitor the dams over the next year before adding more to successful areas next summer. "We put them in areas where there is beaver presence — (where) there have been beaver colonies in the past," Peyton said. "We are giving the beavers a foundation to build off of, because we want to reestablish the beaver colonies and the beavers are symbiotic with coho rearing, so they create this wonderful habitat for juvenile coho to rear and refuge in." Peyton said willow trees were also planted before installing the dams, to assure beavers would have enough food themselves. According to organizers, beavers have already found their way to the newly built analogs, finished just last month. The analogs serve as platforms for beavers to use to continue to build out full-fledged dams. This project, and those to come, are a collaboration effort between many across the region, Peyton said, including the National Oceanic and Atmospheric Administration Restoration Center, Wild Salmon Center, National Fish and Wildlife Foundation, Oregon Watershed Enhancement Board, Oregon Department of Fish and Wildlife, and Bio-Surveys, as well as several years of planning between the Upper and Lower Nehalem Watershed Councils and facilitation by the Wild Salmon Center. While most of the construction took place on public lands managed by the Oregon Department of Forestry, Stimson Lumber Co. near Gaston also played a role in the project. The company donated 15 mature Douglas fir trees to be used for five woody debris structures. Stimson also allowed the structures to be built on its land, specifically for Olsen Creek. "We are all part of this larger movement to recover coho," Peyton said. "Ultimately we are trying to provide juvenile coho with more habitat to rear and refuge in. ... They need cool, protected areas to feed and grow larger, healthier, so their chances of survival are greater when they are in the ocean." Peyton concluded, "We are creating the foundation to let nature take its course. We have our work cut out for us, and the beaver need to be a part of our workforce." Editor's Note: Several quotes previously attributed to Ashley Rood have been corrected to Mark Trenholm.